★ CERAMIC BLADE: Safe & Sharp ceramic blades which is R-shaped rounded edge design can prevent skin from being irritation and hurt. Suitable for all kinds of hair. ★ LCD DISPLAY: 50RPM, 58RPM, 65RPM. Reasonably quiet and powerful motor, which cuts very clean with no pulling of the hair; Large LCD display shows Rotating Speed, Battery Percentage, Oil indicator and Charging indicator. ★ LONG RUNNING TIME: strong powered lithium battery keeps the clipper working up to 4 hours after 180 minutes charged by using the adapter or with stand. You can also use it while charging with the power cord when electricity runs out. ★ DETAILED TRIMMER DESIGN & 4 GUIDED COMBS: It supports precise length setting adjustment range from 0.8mm to 2.0mm and the 4 adjustable guide combs (3mm/5mm/7mm/9mm/), which can be used to cut and style hair to any desired look. 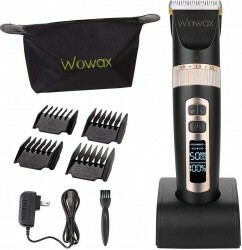 ★ An IDEAL GIFT & BRAND’S PROMISE: WOWAX beard trimming kit comes with a luxury storage bag, which can be as a great gift for your friends and family. WOWAX promise a 3-month money back and1- year replacement warranty! Any problem with products, do not hesitate to contact us!